Very rarely will you come upon an action comedy with talented martial artists in modern Hong Kong cinema that really make you ecstatic. Although, the action is starting to regain it’s foothold in Hong Kong with the likes of Sha Po Lang, Seven Swords, Fearless and the soon to be screening Dragon Tiger Gate; it is time to look back on the glorious days when Kung fu, Action and Action-Comedies were at their peaks. The plot goes like this Sai Bo (Yuen Biao) and his brother Daai Bo (Leung Gar Yan) make a living out of crooked exploits and swindling. Their tricks turn sour and they find themselves stripped of cash with nowhere to turn. Desperate for protection, they scurry under the wings of Ga Mo Do nicknamed, Silver Fox (Lau Gar Wing), only to pay a heavy price when they discover their master is a con man with a violent past. 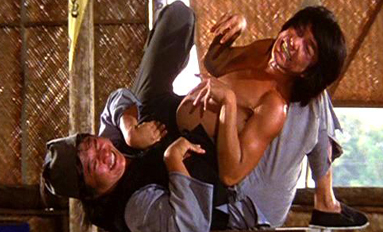 Salvation comes in the unlikely shape of Fatty the Beggar (Sammo Hung), who shows them what real kung fu is all about. In his first starring role, Yuen Biao believably portrays Sai Bo as the smarter of the swindling brothers, whom is left to fend for himself after their master Ga Mo Do (Shaw Brother’s star, Lau Gar Wing), kills his brother after witnessing him kill a sheriff (Mars). Yuen Biao is amazing in his acrobatic display of flips, kicks and punches. His kicking gets really good exposure and he shows off various styles of kung fu including Choy Lee Fat, Wing Chun and Hung Gar as well as Fatty the Beggar’s (Sammo Hung) monkey style. Leung Gar Yan plays the elder of the two swindling brothers, Daai Bo. Having previously worked with Shaw Bros studios and been taught kung fu from Lau Gar Leung, older brother of Lau Gar Wing, Leung’s execution of Flower Fist is convincing when both Sai Bo and Daai Bo test out their skills on ordinary people to make a quick buck. Their master claims that ordinary people cannot defeat the kicking and punching he taught them. Leung Gar Yan as well as Yuen Biao portray their characters as being very cunning, but are vulnerable when they lose all their money. Sammo Hung as well as being the film’s director plays the supporting role of Fatty the Beggar, an expert martial artist, who ends up stealing from both Daai Bo and Sai Bo when both fight about the money they swindled. After the death of his brother, Sai Bo seeks out Fatty, to learn his martial arts in the hope of avenging Daai Bo’s death. Sammo portrays his character with plenty of humour as Sai Bo’s new master. One such example is in one of the training scenes, where Sai Bo has to practice flips while skipping and then after Fatty gets exhausted, is forced by Sai Bo to do it. Lau Gar Wing plays Ga Mo Do a martial arts conman, who is compassionate towards Daai Bo and Sai Bo in taking them as his students, but is also manipulative when two of his former crime partners seek him out. Wing Chun master, Lee Hoi Sang, plays one of them. When Sai Bo witnesses the killing of a sheriff, his master kills Daai Bo. Lau Gar Wing displays some nicely executed martial arts sequences from his Hung Gar training. If you are a fan of old school martial arts comedies, then Knockabout is the perfect film that’ll satisfy your intrigue into the bright kung fu era that was once Hong Kong cinema. Cast: Yuen Biao, Leung Gar Yan, Karl Maka, Lau Gar Wing, Lam Ching Ying, Mars, Lee Hoi Sang.